Make this flavorful dish that combines savory rice, garlic and paprika-marinated chicken and sweet, tangy roast pepper. Combine the chicken, garlic, 1 tablespoon olive oil, paprika, 1/2 teaspoon salt and pepper in a bowl, and stir to combine. Let the chicken marinate for at least 15 minutes. Prepare the pepper cups by cutting the tops off of them. Try and make the cups as deep as possible, but make sure you leave enough pepper on top so that the lid does not fall apart. Scrape out the seeds and membranes with a spoon. 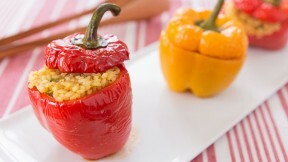 Drizzle 1 tablespoon of olive oil over the pepper cups and lids, and rub with your fingers to coat evenly. Sprinkle with salt and pepper. Preheat the oven to 350 degres F (175 C). Heat a frying pan over medium high heat until hot, and then add the marinated chicken. Brown the chicken on one side, and then flip and brown the other side. Transfer the chicken to a plate, leaving as much oil in the pan as possible. Add the onions and chopped green bell peppers, and sauté until tender and caramelized, adding more oil if needed. Add the rice, and stir until the rice absorbs some oil and becomes translucent. Add the chicken stock, 1/2 teaspoon salt and saffron, and cook, stirring constantly until the rice swells up and the mixture becomes thick enough that you can leave a streak behind by running a spatula across the pan. Turn off the heat, and stir in the reserved chicken. Stuff the peppers with the chicken and rice mixture, and affix the lids. Bake the peppers until they are tender (about 30-40 minutes).